We're the kind of family that takes the top off the pepper shaker and takes a giant pinch to throw in a dish. Or we skip all that take-off-the-top business and just shake (carefully now) from the open shaker into the food. We LOVE pepper! When we eat French fries, we pour some ketchup on the plate or in a ramekin and we shake a lot of pepper into the ketchup rather than over the fries because we just don't want to miss any of that good pepper. We’re also the kind of family that had a great-grandmother who ate onions like apples. We LOVE onions! Willie laughs when we’re in the kitchen, because pretty much no matter what I taste while cooking I say, "I think it needs a little salt." Our family's not really known for loving salt but hey, I had to break free and be my own woman at some point. This soup was one my gramma Darlene Hickman made for us for years, and one we all continue to make in our homes in CA, TX, WA and GA. We all just call it Gramma’s Cabbage Soup. It’s simple, it’s delicious, and it’s good for you. It’s also easy to adjust to your own taste, so feel free to add your favorite vegetables, etc., to it. But, please try it as is first! You will love it! Oh and hey, this soup is filling if you’re trying to watch your weight. It makes a lot of soup if you need to feed a crowd. It’s a must have at our house every year. Heck, it’ll make you happy if you’re sad. I’m convinced there’s nothing this soup can’t do! In a skillet, over medium heat, brown meat. Drain fat and then put the meat back in the skillet and add cabbage and onion; cook for about 2-3 minutes. 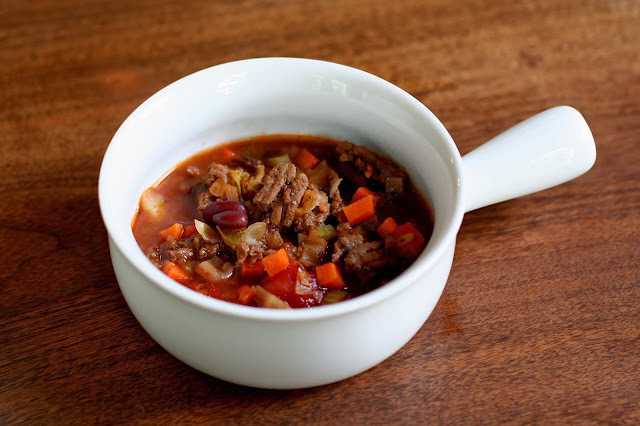 If using bouillon cubes, dissolve these in the broth before adding the broth to the ground beef. Otherwise, add broth and Better than Bouillon to the ground beef and stir. Add the rest of the ingredients. Cook for 30 minutes to 1 hour. Serve. If you would like to refrigerate or freeze this soup, allow it to cool to room temperature before placing in the refrigerator or freezer.